I've solicited advice from any number of folks on the zen of sharpening, but it seems without a hands on session somewhere I am resigned to a certain amount of uncertainty. While the web and print are filled with numerous pictures and text depicting and describing the task, there is a certain resolution that is lacking in these accounts that leave me wanting. It's not for a lack of patience as I've spent the better part of an evening flattening the back of a scrub plane blade, only to be told it should take 1/4 that time (by Mr. Hock no less). It's just that there are certain imperfections that are apparent to my eye, that almost certainly wouldn't make it through the lens of a camera into print or onto the web. All said, the result seems acceptable enough. 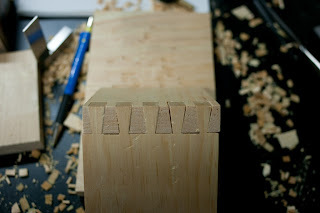 Thin shavings on end grain, and effortless paring with the chisel are the result of mindless stroking on the waterstones. All that and pruned hands. So below lies the toothy grin of my first complete attempt at a dovetail joint. I've cut a small number (4 or 5?) tails, but never pushed through to complete an entire joint. Here is my inaugural attempt in all its toothy glory. 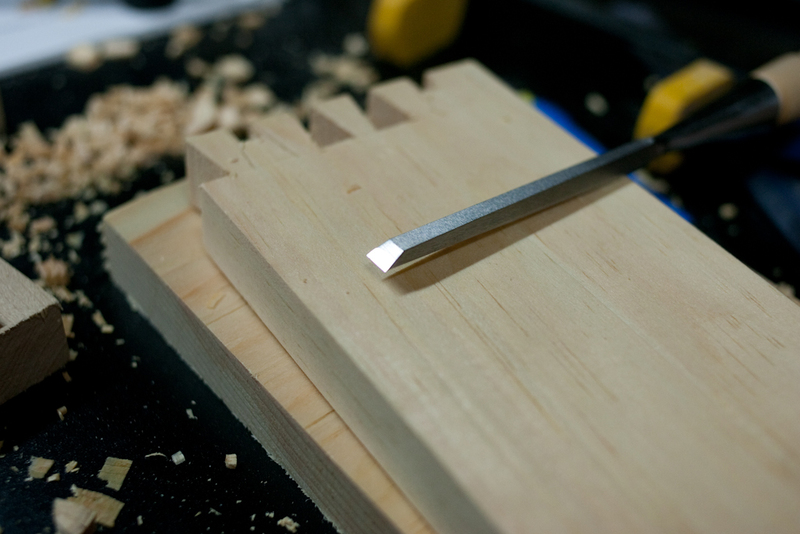 Seems gapped teeth are equally attractive in woodworking and people.